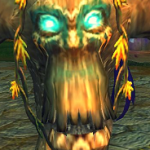 Last week over at Blog Azeroth Feraltree asks us what mementos have we kept from our WoW careers and why. Great topic for me as I am a self-proclaimed WoW packrat. When I look in my bank I see a ton of “useless” items just sitting there. Quest items, class specific drops, herbs out the wazoo and um…*cough* ilvl 200 Boomkin gear…let’s just uhhh disenchant those right now…yeah. But there are a few things in my bank that I will never part with and hold sentimental value to me. And since I cannot link at work (dang blocks! ), you will not be able to see the pretties. Ring of the Heavens (ilvl 56 Green) – My husband (then boyfriend) gave this ring to me in our “secret spot” in Nagrand where we used to hang out. It was so cute and since we did not live in the same state yet ( I was stuck in PA and he in Cali) he would give me little presents to remind me he was thinking of me. One day a few months ago, we were looking in my bank for something and he saw a green ring. Not knowing what it was, he laughed at me and told me to disenchant it. He was shocked to find out that I kept that little green ring in my bank since he gave it to me in 2007, even though I have huge bank management issues and it is constantly packed! Oathkeeper (ilvl 115 Blue two-handed mace) – Another gift from my husband back when we were dating. He gave this to me in the same spot and told me he loved me (mushy!). I have never gotten rid of it and do not plan too. Just like with the ring, when he saw the mace in my bank he told me to DE it to make some room. When he saw I kept it as well as the ring, he blushed a bit and smiled. I think it made him feel good that I had these keepsakes still and reminding him of those days hiding up in Nagrand. I think before the xpac, I will give my bank a HUGE overhaul so that I can actually fit some things in there. But I know I will not get rid of those 2 items and they will probably sit in my bag till the end of time, or end of WoW…whichever comes first! ← Blog Azeroth: What My UI Needs!